Dismissed as usual, and, as usual, admonished to go in peace, glorifying God by our lives, most of our variegated congregation had departed for quickly for lunch and the resumption of the workday, but one of us lingered noticeably. A bespectacled, grey-haired and broadly smiling man, he was dressed in worn but evidently well laundered work clothes. His appearance and demeanor suggested that he was both developmentally disabled and mentally unbalanced, but everything about him suggested that he was as happy as a man could be. He shifted his weight from right foot to left, rocking and crooning and beaming. Clutched in his left hand was a garishly colored toy contraption of wheels, strings and spinning beads, and hovering at his right elbow, a companion caretaker, a relative, perhaps, or an aide from a local nursing home, was gently urging him to withdraw from the church. But the demented man was having none of it. He ignored the quiet pleas, leaned on the Basilica’s baptismal fount as familiarly as a regular might lean on the bar of a neighborhood tavern, and locked his eyes lovingly on the golden gothic tabernacle above the main altar. Softly, he began to sing a melody of gibberish—broken off now and then with delighted laughter—but a song as reverent as any a monastic choir has ever sung. Those of us who filed shyly past him were unable to suppress our own smiles, from which wonder had driven all derision. I wonder if he’s still signing there as I write. The design, paintings, stained glass, gold leaf and shafts of numinous light in the Basilica of the Sacred Heart are beautiful, certainly, but by visiting the Love of his life there to sing a halfwit psalm this morning, a holy man has burnished that beauty to a whole new brightness. In my own notes, I substitute “prayer” for “poem,” confident that Mr. Stevens doesn’t mind. Poetry and prayer are never very far apart. Ezra Pound thought that as music drifted away from the dance, it became less music, and that as poetry drifted away from music, it became less poetry. Poetry may drift away from prayer, but prayer doesn’t drift away from anything. Prayer can pounce on a poem (or a soul) unbidden as a bobcat dropping from a tree limb, all fangs and claws. Prayer is downright predatory. Prayer can pick up a sinner’s scent, silently begin to stalk, keep motionless watch for hours, and patiently await the moment to leap. Prayer knows all about sin—how it begins to debilitate a sinner immediately, how it weighs a sinner down, how its burden grows steadily, relentlessly, remorselessly. Prayer can sense a sinner’s weakening, bogging down beneath the sin’s weight. Sometimes, prayer is waiting for the sinner when he wakes up in the morning. The sinner is, say, standing at the sink, drawing tap water into an espresso pot and staring out the kitchen window into the olive-tinted light of the backyard. Prayer dispels the sinner’s morning stupor and invites him to utter itself. What releases prayer is this: That the morning seems suddenly alien, the sunlight seems such as the sinner has never beheld, the vibrant backyard seems no country of his, and the world around him seems suddenly a soul unto itself. And not his soul. On such a morning, prayer may agree that the sinner will never be entirely at home here in this world which is as sure to end as the sinner is to live forever. Prayer may remark that the sinner must nevertheless be grateful to visit and, however briefly, inhabit this place where sunlight transpierces oak leaves and make them glitter like emeralds. To which, of course, the sinner gives the only conceivable reply. The quaint word “fortnight” had seldom been heard in America before the United States Conference of Catholic Bishops (USCCB) adopted it for use in a campaign for religious liberty. A principal concern of the USCCB’s “Fortnight for Freedom” is, of course, a federal law that could require conscientious private employers (most notably Catholic ones) to support services (most notably contraceptive and abortifacient ones) morally repugnant to them. Whether or not that law is eviscerated, as it may soon be, by a Supreme Court decision, the Fortnight for Freedom anticipates this year’s Independence Day with a uniquely blended celebration of civil liberty and Christian martyrdom. The feasts of Saints Thomas More, John Fisher, John the Baptist, Peter, Paul and the First Martyrs of the Church of Rome all fall in those two weeks prior to the Fourth of July, commemorating the legal executions of men and women whose obedience to the Gospel was inconvenient for established authority. Whether by episcopal intention or chronological accident, the Fortnight celebration also anticipates the nation’s general election, and America’s Catholic bishops have been criticized by some and praised by others for appearing to rebuke a vulnerable incumbent president and appearing to endorse the party opposing him. Such criticism and praise will likely continue at a high decibel level long after November 6. It would be a shame if all this noise were to discourage our recently emboldened bishops, because the Health and Human Services mandate is only one of the noticeable ways governmental authority requires the suppression of Christian conscience. Leaving aside a couple of undeclared wars, here a few other things that Christian taxpayers have recently been obliged by law to subsidize, regardless of what our consciences have to say about them: Drone missile strikes and the “collateral damage” they inflict on Pakastani and Afghan villagers; overseas assassinations carried out for the last two administrations on presidential whim; the injection of lethal quantities of Sodium Pentathol, Pancuronium Bromide and Potassium Chloride into the veins of condemned prisoners; the prison camp in Guantanamo; the torture of some suspected terrorists and the extradition of others to countries where torture is less fastidiously regulated than it is here. I could go on, but we have yet to hear from our bishops on these matters, and I hope and pray that we will. That is a conclusion worthy of fireworks, legal or illegal. Happy Independence Day. Yesterday, Ash Wednesday, the 12:10 Mass in the crypt of Notre Dame’s Basilica of the Sacred Heart was a bit more crowded than usual, in fact, a standing-room-only affair. It was to be expected. On Sundays and ten other holy days, Church law requires Catholics to be at Mass, but not on Ash Wednesday, when every Mass seems nevertheless to be jammed to the rafters. Nor do we look all that gloomy, come to think of it. Hypocrites we may well be, but most of us came out of the crypt yesterday chatting companionably as we returned to our various workplaces, this after being reminded singly and severally that we were dust and that into dust we would return. At least for a few moments after Mass, it felt fine with me to know that I was dust—as if I knew that the dust which I was and would return to was dust I could well afford to lose, as surely I could afford to lose a few pounds by my fasting, to lose a few dollars by helping out the poor, to lose a few enemies by refusing to have enemies, to lose the craven being I’d made of myself by despairing of it for the time being, and letting God make something better. At least that was how it felt. And the expressions on most of the ash-smeared faces of the others suggested that I was not alone in that feeling. I knew, of course, that the feeling was as ephemeral as the ashes themselves: As the days of Lent lengthened, my resolve would wane and my temper shorten. Ash Wednesday begins “the time of tension between dying and birth,” that T.S. Eliot’s eponymous poem describes, and the Lenten weather forecast is raw, grey, and rainy. Mildly cursing as I scraped a thin coat of ice from the car windshield early Thursday morning, I ruefully noted how much that rime resembled the coating of a chilled martini glass. The sun was rising sluggishly, but enough to make the hoarfrost sparkle, to make each glint suggest a tiny Pascal flame. Cross-posted to Notre Dame Magazine. I thought of Mailer’s remark last night as I heard Phil Sloan give a fascinating lecture to the Institute for Church Life’s Human Dignity class, making more comprehensible—at least to one of his intellectually-impaired listeners—what Pope John Paul II called the “ontological difference” between human beings and other species of life. Not even so lucid and adept a philosopher as Phil was able make that phrase entirely comprehensible to me, but a visual aid he had chosen was helpful. 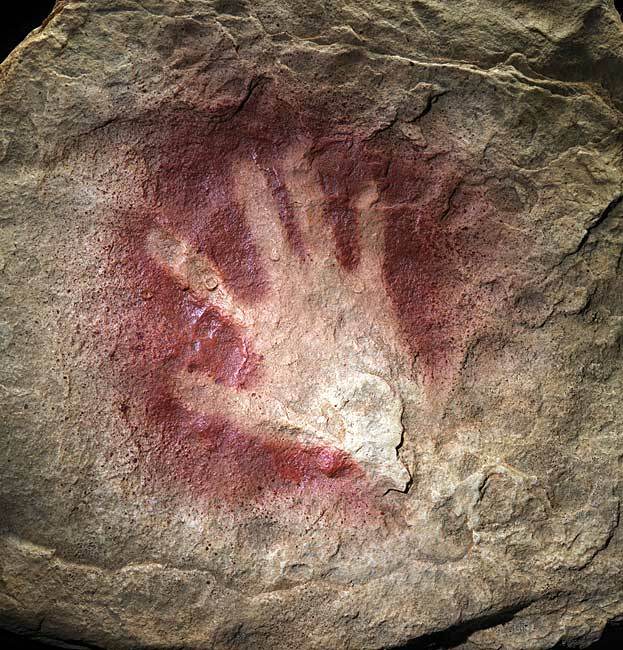 On a large projector screen behind him as he spoke was a slide of an image left behind some 33,000 years ago by a paleolithic visitor to a cave at Chauvet Pont d’Arc in the south of France. It was a stencil of a human hand, a sort of ‘Kilroy was here’ graffito from one particular and unimaginably distant ancestor of ours. The Chauvet cave walls are resplendent with other images: magnificently vivid renderings of cave bears, lions, mammoths, rhinos, horses, bison, ibexes, reindeer, red deer, musk-oxen, bison, panthers, and owls. Scholars of various disciplines argue over the shamanistic, or magical, or religious, or ritualistic intentions of the cave artists. They may have been playing, they may have been praying, they may have been recording what they thought they knew. An astonishing expertise has animated these galloping horses, surging bison herds, and charging rhinos. What are they running from or toward? Why, so many millennia later, does a lump rise in my throat as my imagination strains after that glorious, ever-vanishing, subterranean stampede? Because my work in public relations at Notre Dame preoccupies me with what the life of the University and the life of the Catholic Church have to do with each other, I’ve been paying more attention than is perhaps healthy to the just-concluded annual three-day meeting of our country’s Catholic bishops in Baltimore. As the bishops gathered in Baltimore, Michael Gerson’s Washington Post column concerned the intensifying antagonism between these men and the Obama administration, a neuralgic relationship conspicuously and painfully dramatized in the controversy surrounding Notre Dame’s 2009 commencement ceremonies. On the first day of the meeting, the chairman of a newly established Committee for Religious Liberty, Bishop William E. Lori of Bridgeport, Conn., spoke of how he and his brother bishops “viewed with growing alarm the ongoing erosion of religious liberty in our country.” Bishop Lori cited recent policies of the Department of Health and Human Services, specifically draft HHS regulations requiring all private health insurance plans to provide coverage for sterilization and contraception as particularly alarming, echoing concerns that Notre Dame president Rev. John I. Jenkins, C.S.C. had expressed a few weeks earlier in an open letter to Kathleen Sibelius. More recently, a one-year grant to the Catholic Migration and Refugee Services has been withheld because of their failure to provide foreign-born human trafficking victims access to what HHS euphemistically describes as a “full range of reproductive service,” including abortion and contraception, to trafficking victims. Presumably, Notre Dame law professor Richard Garnett, who has been appointed a consultant to the bishops’ new committee, and who has a particular interest in the relationships between the church and the state, will have some interesting things to say about that. Among other issues under discussion at the Baltimore meeting were the difficulties the Catholic church encounters in the attempt to evangelize an increasingly secular culture, which was exactly the theme of a conference convened by the Center for Ethics and Culture at Notre Dame earlier this month. I had the privilege of chairing one of the sessions of Radical Emancipation: Confronting the Challenge of Secularism the 12th such event held annually by the center, which this year drew an international throng of more than 650 young scholars to the campus. Finally, the bishops discussed the new translation of the Roman Missal which will become standard in English-speaking countries beginning Nov. 27, the first Sunday of Advent. At least since last summer, several Notre Dame theologians have been preparing the way for that. Notre Dame’s president emeritus, Rev. Theodore M. Hesburgh, C.S.C., has famously described Notre Dame as the place where the Church does her thinking. During the last few days, his claim sounds modest enough. Notre Dame theologian Gary Anderson, an Old Testament scholar, recently wrote an essay on on purgatory for the magazine First Things, describing how that doctrine — sometimes disparaged as a spurious medieval contrivance to sell indulgences, other times accepted as a theologically appealing but scripturally warrantless idea — has deep biblical roots. Unresting or not, death had been an insistent presence already this month. At the hospital bedside of an old friend, at the nursing home where my father-in-law wound down his days, in the obituaries I’d written at work, in the wrinkled and washed-out features that stared dully from the mirror as I’d brushed my teeth that morning. Early Sunday morning I arose, aching all over from Saturday’s yard work, brewed coffee and stood in the front door of our house, facing east and marveling at the absolute absence of breeze. The ascending steam from the coffee cup was utterly vertical, untroubled by so much as a breath of wind. I looked for a while at the paisley windrows of dead leaves I’d raked and banked on the roadside the day before, and I prayed for the dearest of my dead and dying, for the heart to face the hour of my own death, and for the grace of a gentle judgment. Everything, I thought, even this moment, will die in time, as those I love and those I must learn to love and I myself must die. Then, engulfing and absorbing that thought, the stillness of the morning surged up around the crow caws from a backyard thicket, as each sienna oak and golden maple leaf fell plumb straight to an increasingly strewn front lawn, steadily and audibly piling. The dead leaves kept falling faster than sight could keep up with, accentuating the sharp glint of dawn and streaking the azure sky in the east. It seared the eyes and forced tears, this light far too fierce to look at long, but far too fine to look away from. I knew it was a light proffered from purgatory’s flame. Cross-posted to Notre Dame Magazine website. Anderson writes about purgatory in the November issue of First Things. Subscribers can read it online, and nonsubscribers should be assured that the regular appearance of essays like Anderson’s is why First Things is a magazine very much worth subscribing to. The bishops’ solicitude for parishoners sensitive to fire-arm prohibitive signs (“…we encourage you to consult with your insurance carriers as you proceed, and to consider how posting signs helps pastors balance the need for reverence in sacred space with their desire for security…”) is a particularly nice touch. If we Catholics can from time to time seem a bit fastidious about how Mass is to be celebrated, it is only because we believe in the reality behind the somewhat arid language of the Catechism; we believe that at Mass “under the consecrated species of bread and wine Christ himself, living and glorious, is present in a true, real, and substantial manner: his Body and his Blood, with his soul and his divinity.” Before we eat that meal, we offer one another a “sign of peace,” usually a handshake—that ancient symbol which vastly predates the establishment of our church and which is generally believed to have originated as an emphatic demonstration of disarmament, a proof that the extended hand holds no weapon. Of her many titles, I’ve always preferred that one. Don’t get me wrong…I regard her as royalty, as exalted humanity, as my queen…to the extent that an Irish-American can extol any human being as queen. But she’s first, foremost, and always, the Mother of God, and consequently, my own. When God decided to become one of us, things got exactly this messy. The doctrine of the Incarnation being what it is, I’ve often wondered what it would be like if the real Mother of God…an embarrassingly and inconveniently pregnant Levantine teenager…showed up amidst the university and community named in her honor. How welcome would she be? Among those who gossip about such things, there would certainly have surfaced the awkwardly timed pregnancy, the laughably pious account of her fiancé, and then (if it were to be excused by the Office of Student Affairs) the leave of absence to take care of her old and improbably expectant cousin. “Jesus might notta been white trash,” a preacher from Central Illinois once told me, “but He sure come from white trash.” I agree. So I must be more careful when I sneer, as I often do, at people like my Lord and his mother. It seems to me that we here, all of us at Notre Dame, from the dishwashers in the South Dining Hall to the rising faculty stars, associate provosts and college deans, are at our best when we act as children of this agreeably indulgent and continually inventive mother than as “leaders” or “change agents” or cutting-edge innovators of the Next Big Thing. We’re at our best when we remember that all of this began because an amazing Nazarene shiksa said she wasn’t afraid. No wonder we love her.